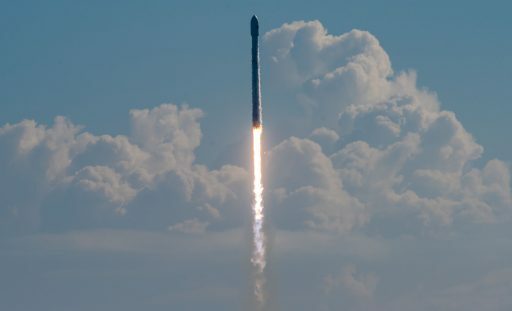 A SpaceX Falcon 9 blasted into partly cloudy skies over Cape Canaveral on Thursday, carrying into orbit the U.S. Air Force’s X-37B winged space plane on a mostly classified mission to test out new technologies in space and perform a range of experiments out of public view as part of the program’s fifth flight. The looming arrival of Hurricane Irma created some pressure on getting Falcon 9 off the ground on time to move the X-37B out of harm’s way by sending it into orbit prior to the storm trekking over Florida if current forecast models hold true. The Kennedy Space Center and neighboring Cape Canaveral Air Force Station were placed under Hurricane Condition, initiating preparations of equipment and facilities for the potential arrival of Irma – only giving SpaceX opportunities on Thursday before Falcon 9 would have needed to take shelter inside the hangar at Launch Complex 39A. 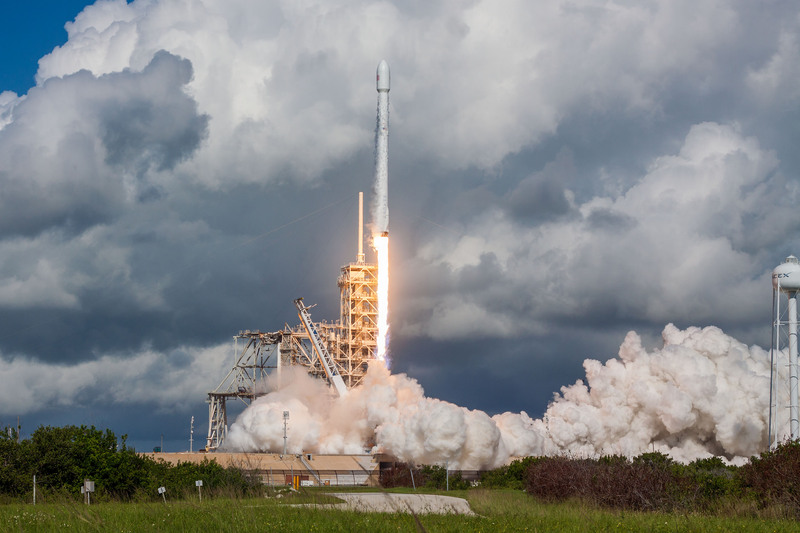 Luckily, local weather cooperated and Falcon 9 was able to move through a smooth countdown on Thursday leading up to blastoff at 14:00 UTC, 10 a.m. local time. Climbing out from the former Saturn V and Space Shuttle Launch Pad, the 70-meter tall Falcon 9 swung to the north east – burning its nine Merlin 1D main engines for just shy of two and a half minutes before the MVac-powered second stage fired up to deliver the five-metric-ton X-37B into a classified orbit. While the second stage headed into orbit without the public watching, the first stage booster performed a rocket-powered U-turn to accelerate back toward Cape Canaveral. A burn at re-entry decelerated the 47-meter tall first stage and a half-minute burn of the center engine slowed the booster for a gentle touchdown on four fold-out landing legs. Standing tall at the Cape’s Landing Zone-1 after mastering SpaceX’s seventh land-based return, Booster #1040 will be secured and moved to safety as swiftly as possible prior to Irma’s arrival – currently expected Sunday night. The U.S. Air Force’s X-37B Orbital Test Vehicle (OTV) is an uncrewed re-usable space plane capable of carrying out extended missions in Low Earth Orbit before returning to Earth with its experimental payloads protected within the craft’s payload bay. X-37B – developed by Boeing’s Phantom Works division in cooperation with the Air Force – evolved from NASA and DARPA’s X-37A project initiated in 1999 but abandoned after a series of glide flight tests in 2006. 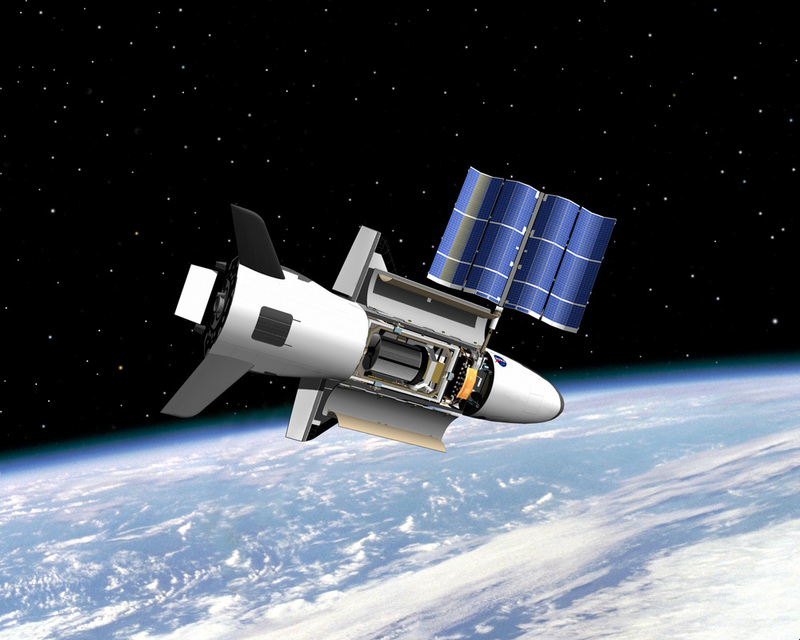 X-37A has been envisioned to be deployed by the Space Shuttle to carry out its own satellite servicing or scientific missions beyond the maximum mission duration of the Shuttle Orbiter. Taking over the project from NASA, the U.S. Air Force Rapid Capabilities Office set out to create a multi-mission capable vehicle to satisfy the demand for responsive access to space for various experiments, testing of various emerging technologies and, possibly, space-based intelligence gathering. The X-37B weighs around five metric tons at liftoff, standing 8.9 meters tall underneath the rocket’s payload fairing with a wingspan of 4.5 meters. It offers a 2.1 by 1.2-meter payload pay that opens up once the craft arrives in orbit to deploy a power-generating solar array and expose whatever payloads are aboard the craft to the space environment. All four previous X-37B missions rocketed into orbit atop Atlas V launch vehicles, the first began in April 2010 and lasted 224 days, serving as a shakedown mission to validate the spacecraft’s design on an operational mission with much focus on the vehicle’s autonomous landing on a runway at Vandenberg Air Force Base – the first fully autonomous runway landing carried out by an American spacecraft. OTV-2, launching in March 2011, already surpassed the originally envisioned 270-day mission duration with a flight of 469 days and OTV-3 – flying from 2012 to 2014 – further pushed the craft’s maximum flight duration to 675 days. The fourth flight of the winged spacecraft topped the scales with a duration of 718 days – launching in May 2015, roaming between 307 and 357 Kilometers in altitude for nearly two years and becoming the first OTV mission to land at the Kennedy Space Center’s Shuttle Landing Facility to keep post-flight and pre-launch processing in one location after Boeing took over former Shuttle Orbiter Processing Facility 1 to become the X-37B’s home on the east coast. 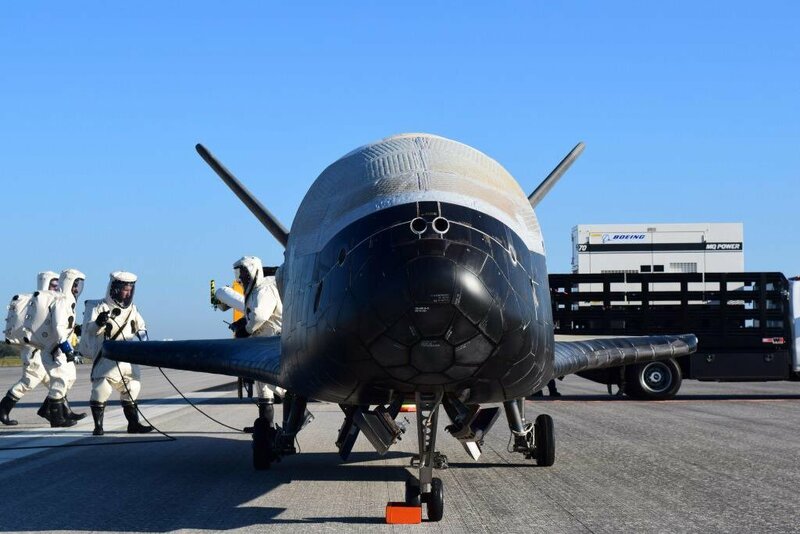 OTV-5 has the overall objective of advancing the X-37B to more fully support the growing space community, flying a series of payloads aboard the space plane including technology demonstrators. As with previous OTV flights, specific details on the craft’s mission like its operating orbit, target mission duration or specifications on the payloads aboard the vehicle are kept secret by the Air Force. However, the Air Force stated that the OTV-5 mission would fly in a higher-inclined orbit than its predecessors to broaden the X-37B’s flight environments. One payload on the OTV-5 mission that was publicly acknowledged is the Air Force Research Laboratory Advanced Structurally Embedded Thermal Spreader that will test experimental electronics and oscillating heat pipe technologies over a long-duration space flight. Three oscillating heat pipes are part of the package to evaluate the technology for future applications in space as it could offer lighter and less expensive thermal control solutions for satellite missions. The goal of the OTV-5-mounted experiment will be to evaluate the technology’s initial thermal performance and monitor it over an extended period to assess long-term degradation. The Air Force also said the OTV-5 mission hosts small satellite ride shares to demonstrate greater opportunities for rapid space access. It was not specified whether the ride share satellites were to be deployed from the X-37B itself or a deployer mounted on the Falcon 9 rocket’s second stage. 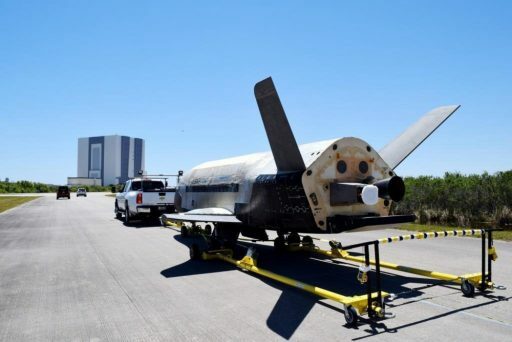 It was not announced which of the two X-37B space vehicles was flying on the OTV-5 mission, but based on announcements made for the first three missions it is assumed that flights alternate between the two craft. 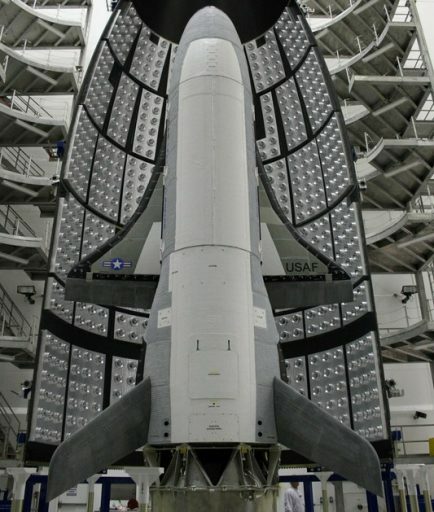 This would mean OTV-5 is the third trip into space for the first X-37B spacecraft. With only one day of launch opportunities, SpaceX aimed to make it count – wheeling the Falcon 9 out on Wednesday sitting on its Transporter, Erector, Launcher that was slightly modified to add a structural support for the X-37B when in a horizontal position as the craft is normally integrated in a vertical posture. Also, the TEL featured an additional purge supply, flowing purge gas into the tail end of the X-37B within the 5.2-meter diameter Falcon 9 payload fairing. Thursday’s launch period stretched from 13:50 through 18:55 UTC with several available windows within the broader launch period. 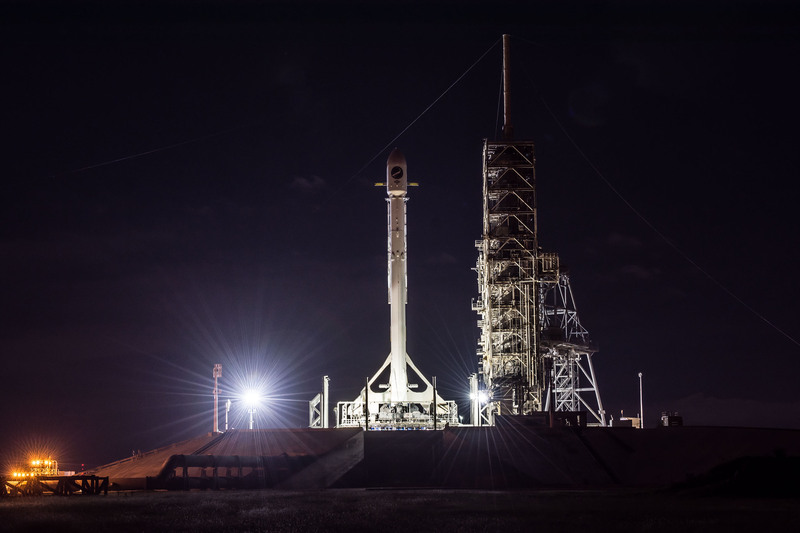 SpaceX ran Falcon 9 through a smooth countdown – starting with Falcon 9 going vertical overnight for power-up and several hours of thorough launch vehicle and ground systems checks to clear the way for fueling. Controllers also had eyes on the cloud cover over the Cape and solar/geomagnetic activity, but luckily all remained within limits to permit an attempt near the opening of the window at 14 UTC. With T-0 set, the automatic launch sequencer kicked in at T-1 hour to take Falcon 9 through the complex tanking sequence starting with loading the two-stage stack with around 155 metric tons of Rocket Propellant 1, chilled to -7°C. 360 metric tons of densified Liquid Oxygen chilled to -207°C were pumped into the first stage starting at T-35 minutes with the second stage following suit at T-20 minutes to reach flight level just inside T-2 minutes. 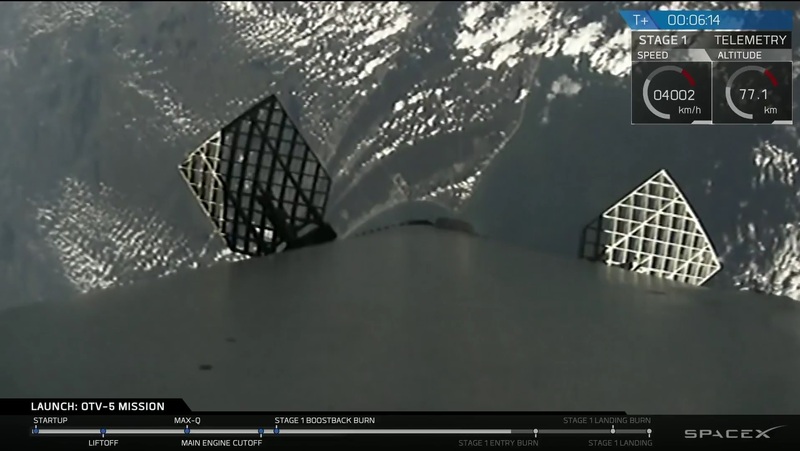 Falcon 9 continued to be well behaved through its fast-paced final countdown sequence, going into motion at T-7 minutes with the chilldown of the nine Merlin 1D engines. 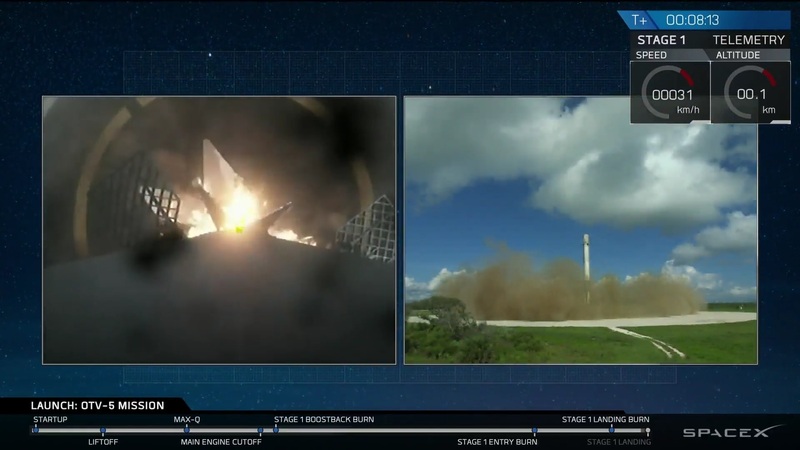 Falcon 9 switched its two stages to internal power, the Strongback moved back and was primed for a rapid kickback at T-0 and the triple-redundant flight control system was aligned for flight. 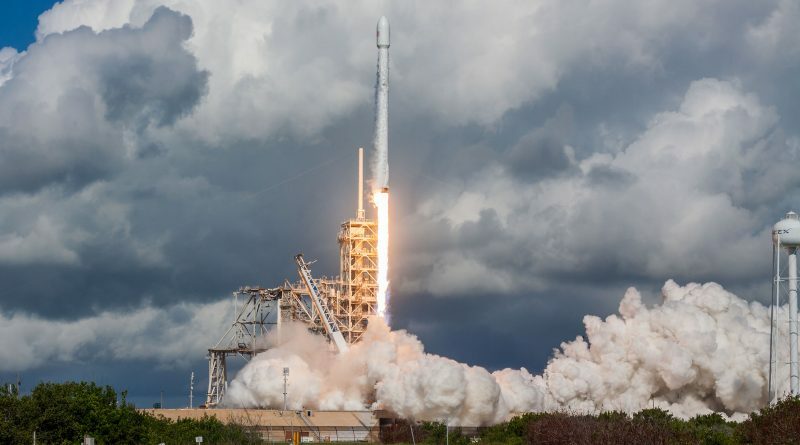 The Autonomous Flight Termination System was armed and final approval for liftoff was voiced from the Eastern Range and Launch Director while Falcon 9 went into final tank pressurization. Falcon 9 soared to life at T-3 seconds and blasted off when clocks hit zero with a thrust of nearly 700 metric-ton-force. The 20-story vehicle balanced in a vertical posture for the first seconds of flight, clearing the 106-meter tall tower at LC-39A before entering its pitch and roll maneuver to attain a north-easterly heading identified through Notices to Airmen and Mariners published prior to launch. Guzzling down 2,450 Kilograms of propellants per second, Falcon 9 went through the sound barrier around 73 seconds into the flight followed six seconds later by Maximum Dynamic Pressure for which the nine engines throttled back briefly to reduce stress on the ascending vehicle. The first stage finished its role in the primary mission two minutes and 24 seconds into the flight, having boosted the vehicle to a speed of 1,660 meters per second. 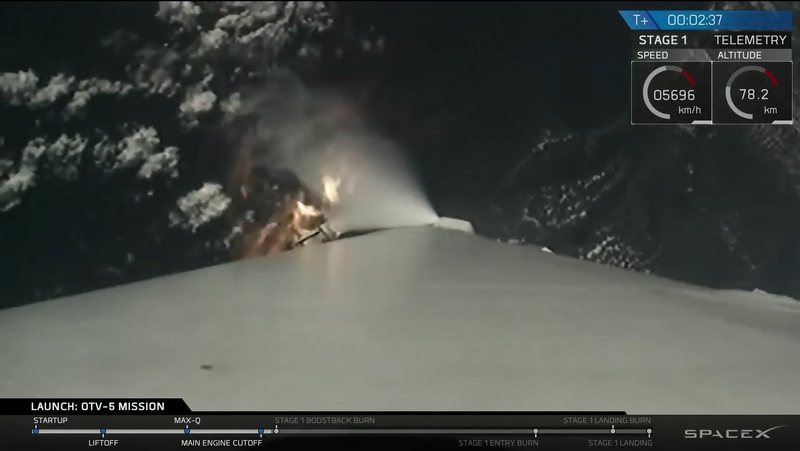 Stage separation occurred three seconds later at an altitude of 69 Kilometers with the first stage heading off on its return to Cape Canaveral while the second stage went into start-up mode for the boost into orbit. The first stage wasted no time after staging as every second carried it further downrange from its landing site. Using its cold gas thrusters, the booster initiated a rapid flip maneuver to point its engines toward the direction of travel for the boost back maneuver – initially lighting only the center engine two minutes and 40 seconds into the flight to finish the flip followed by ignition of two outer engine five seconds later when the stage was level on the velocity vector. Blasting the engines for 55 seconds allowed the first stage to reverse course toward Cape Canaveral. During three minutes of coasting outside the atmosphere, Stage 1 passed an apogee of 136 Kilometers before falling back toward Earth, accelerating in speed as it approached the dense layers of the atmosphere. 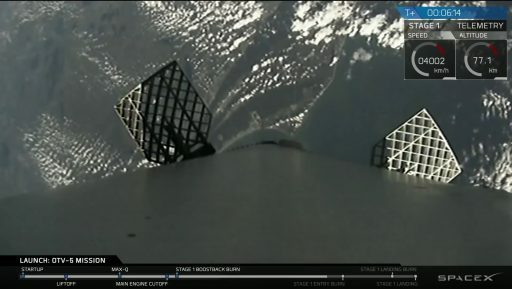 Cape Canaveral came into view from the booster’s onboard camera as it reached a top speed of 1,291m/s at the start of the entry burn six minutes and 32 seconds into the flight. Using a staggered ignition & shutdown scheme, the entry burn lasted twenty seconds and slowed the vehicle by 745 meters per second – creating a fairly benign re-entry at a speed of Mach 2.2. 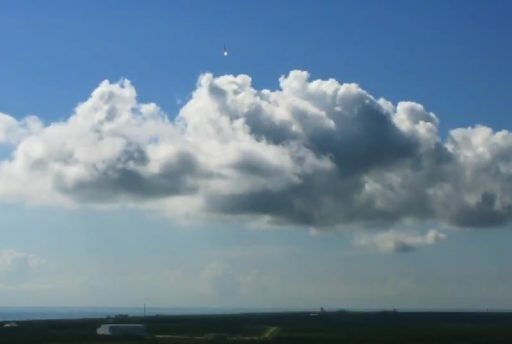 The booster relied on its four actuated grid fins during 50 seconds of atmospheric descent, fine-tuning its course toward LZ-1 as the booster crossed the sound barrier for the second time on Thursday. Ignition of the Center Engine on the landing burn occurred seven minutes and 44 seconds into the flight to slow the booster down for landing, deploying its four landing legs and coming to a gentle on-target touchdown approximately eight minutes and 13 seconds after launch. 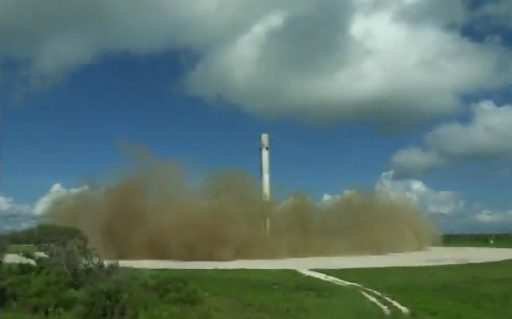 The successful landing of Block 4 Booster #1040 brought SpaceX’s total to 16 successful recoveries out of 21 tries, involving 14 different boosters (two re-flown boosters were recovered). For landing on land, SpaceX is keeping a perfect 7/7 record and Thursday’s landing was the 12th successful recovery in a row. While the first stage was going through the motions for landing, the second stage was tasked with earning the money via delivering the X-37B to orbit. Ignition of the MVac engine of the second stage was confirmed shortly after staging and onboard footage from the first stage showed the 13-meter long payload fairing halves tumbling away from the upper stage after separating outside the dense atmosphere. It is unknown whether Thursday’s mission featured a fairing recovery attempt. The expectation for a Low Earth Orbit delivery by Falcon 9 would be for the second stage to reach its target orbit with a single burn, but no information on Thursday’s flight profile was provided. The re-entry area of the second stage over the ocean between Australia and Antarctica points to a major inclination change to occur at some point during second stage flight as the initial heading of Falcon 9 pointed toward a 43-degree orbit and the entry zone is more indicative of a 60-70-degree orbit. A possibility would be a fairly large dogleg maneuver during the second stage burn to satisfy OTV-5’s requirement of a higher-inclination than its predecessors. The second stage re-entry zone is in effect from T+3 hours and 54 minutes, indicating a fairly long coast will be performed by the vehicle prior to disposal – possibly to deploy secondary payloads. Successful OTV-5 deployment was confirmed by the Air Force later on Thursday and it is now up to the satellite tracking community to spot the craft in its classified orbit.